Ban Suriya (it translates to mean “Sunshine House”) is set in a former coconut plantation along Lipa Noi Beach. 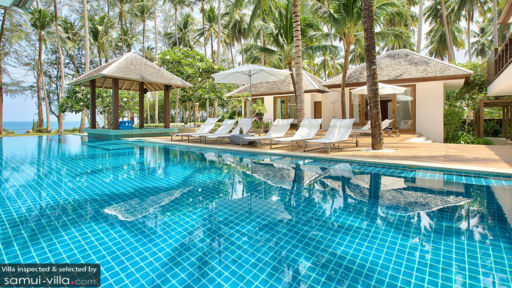 The location is tranquil and unspoilt - just perfect for vacationers seeking to getaway from the hustle and bustle of the eastern part of Samui. With six bedrooms spread across a sprawling estate, Ban Suriya is a great bet for large group getaways, and doubles up as an excellent venue for weddings and events. Up to 15 guests are comfortably accommodated in six bedrooms. Each of the rooms features a contemporary decor, sunlit interiors and an inviting ambience. Four of the rooms feature four poster beds, one is fitted out with a double bed and the sixth bedroom is outfitted with twin singles and two roll-out beds. The first bedroom (‘The Suriya’) opens out to a cactus garden, and ‘The Wave’ offers direct access to the beachfront lawn. Three of the rooms lead out to the main pool deck or jacuzzi deck. A fully equipped outdoor compound offers no end options for relaxation or activity. Feel like chilling out? Take a dip in the turquoise pool, lay back against the poolside recliners, kick back for an open-air movie night (there’s an outdoor movie screen!) or unwind in the spa room. There’s three other massage areas in addition to the spa room - one of which is up in a tree house - so you get to pick and choose! Looking to work off excess energy? Head out to the private beach for a game of volleyball, or get a workout in the gym (it comes complete with weights, machines, a punching bag, Bose iPod speaker and yoga mats). Or keep things fun with a foosball match or a Nintendo Wii game. A sparkling all-white kitchen is where your private chef will whip up meals using fruits, vegetables and herbs from the villa’s garden. It extends out towards a spacious dining area. A sunken library features an extensive collection of books and board games, as well as an underwater window to the pool. Ascend the cantilever stairs to a cosy mezzanine floor furnished with sofas and recliners. Step out to the terrace to access the pool table or sunset bar. As a wedding venue, Ban Suriya offers a maximum capacity of 150 guests. A minimum booking of five nights, along with a refundable deposit, cleaning fee and premiums will apply. 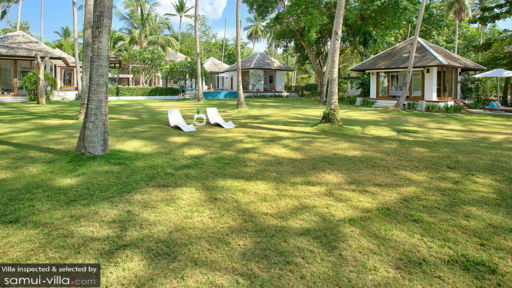 Ban Suriya is a full-service vacation rental with a villa manager, concierge, resident chef and housekeeping team. Amenities that are available free of charge include: baby cot, daily breakfast and airport transfers. 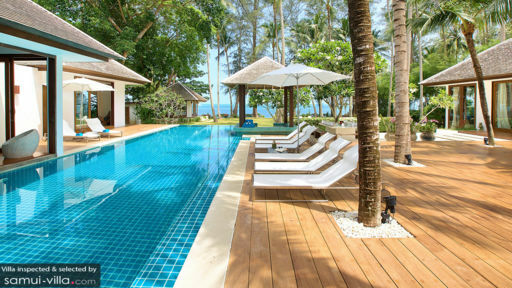 Additional costs apply for the following amenities: villa pre-stocking, car rental, additional bedding, Nespresso coffee pods, tours, child minding service, in-villa spa treatments and in-villa yoga, personal fitness or Muay Thai boxing classes. The powdery white sand shores of Lipa Noi Beach is just a skip away. Within the vicinity are seafront yoga retreats, walking streets and high-end spa venues; places that come with our recommendations include Marga Yoga, Nathon night food market and Baan Thai Spa at InterContinental Samui. When you’re not enjoying in-villa dining experiences at Ban Suriya, take your pick from nearby options like Nikki Beach Club (it’s our go-to spot for Sunday brunches), The Virgin Coast Restaurant or one of the many seafood restos at Thongkrut Fisherman’s Village. For fine dining, check out The Five Islands or the Island View Restaurant. Attractions like the Samui Cultural Center, Laem Sor Pagoda, Secret Buddha Garden and Wat Samut Tharam are located within an easy drive from your villa. Angthong National Marine Park, an archipelago of 42 islands is a popular offshore attraction. Speedboats depart from Nathon Pier (located 13 minutes’ drive away), and it’s a 45-minute ride to the islands.